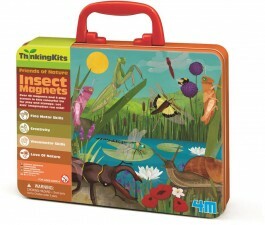 Unravel the mystery of magnets with our Science Kit that is fun for experiments and games. Includes everything you need to build a mysterious dangler, fishing game, levitron racer and more. Intriguing activities that are also educational. Get pulled into the world of magnetism with our selection of educational kits, magnet toys for kids and magnet science experiments. Magnetic building toys are great for development STEM learning and skills for kids. It would be a fun learning experience for the kids since the magnets add an element to conventional construction and hold the structure together. This is good for developing their motor skills. Children nowadays are exposed to electronic devices, it is only natural because we are surrounded by technology. The only deal here is to have it balance, aside from using electronic devices, introduce something that is a little more challenging at the same time having fun. Give them toys like magnetic building toys or kits. Here are the advantages of Magnetic Toys Magnets are fantastic—for your kids as well as for you, the parents. Here are the reasons: • The perfect toy for when you need quiet time. • They keep the kids away from the electronic gadgets. • No need for batteries to use them. • Great for group play setting as well as during solo play. • They keep your kids engaged while travelling or eating out. • Develops children valuable skills like creativity, geometry, spelling, spatial reasoning, excellent motor skills, patience, and experimentation.